I dedicated “Between Black and White” to my Mom and Dad. 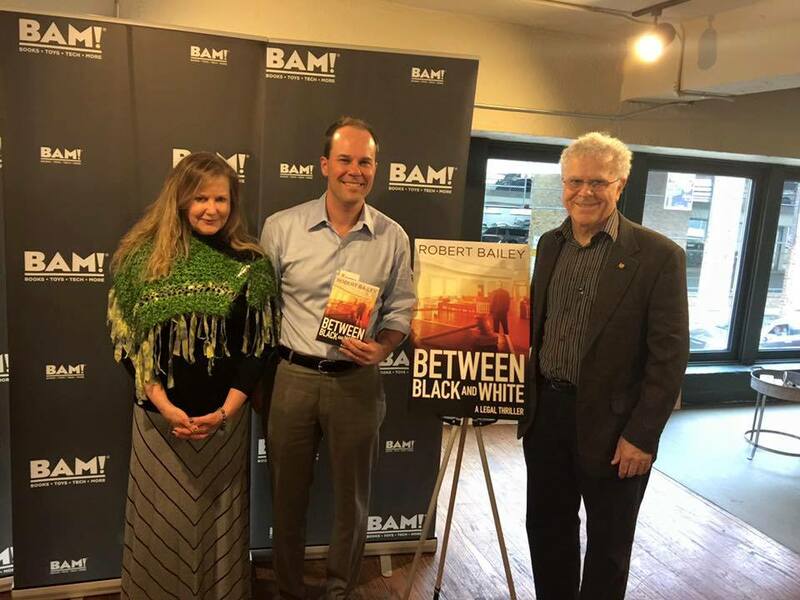 “Between Black and White” released on Tuesday, March 15, 2016, and the last ten days have been a whirlwind! On Thursday, March 17th, we had a fantastic St. Patrick’s Day book launch at U.G. White Mercantile in my hometown of Huntsville, Alabama with Books-A-Million selling the books and Old Town Beer Exchange providing the refreshments. It was an incredible night catching up with family, friends, colleagues and fans of the stories. 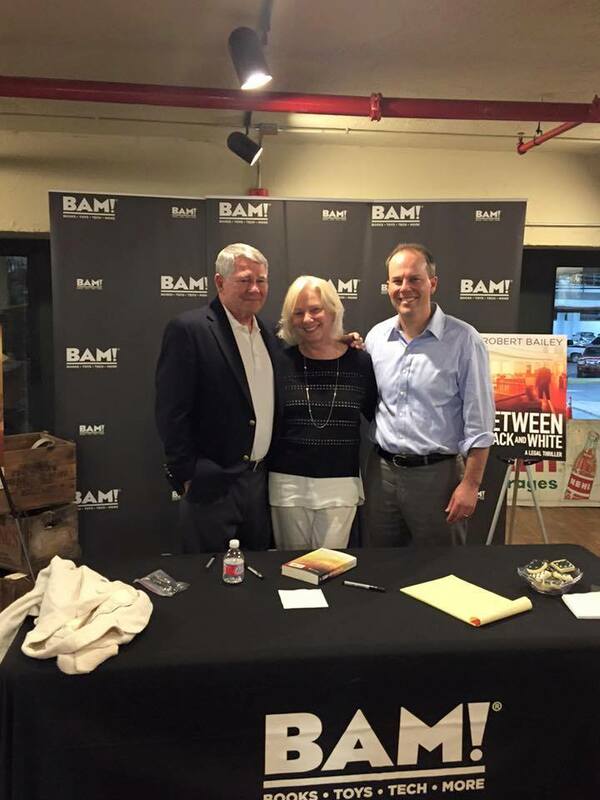 All total, BAM sold approximately 170 books. Special thanks go out to Derrick Young and U.G. White for hosting a wonderful event, to BAM for making the sales and signing process smooth and efficient and to Bill Fowler and everyone at Old Town Beer Exchange for bringing such awesome beer and wine. Also, a huge debt of gratitude to my wife, Dixie Bailey, sister in law, Christi Davis League, friends, Bill and Melanie Fowler and Adam Campbell for helping with setup. On Monday, March 21st, our book tour went south for Spring Break with a signing on the porch at Sundog Books in Seaside. It is hard to beat the scene and foot traffic in Seaside, and we sold 31 books all the while catching up with friends and family. Special thanks to my longtime friends, James Drake, Walker and Shelly Cagle, Terry and Brooke Edmondson, Mark and Julie Hunter, Casey Jernigan King, Graham Burgess and Amy Creech for coming to the event. Also, a big shout out to my father in law, Dr. Jim Davis, his wife Janie, and my sister in law, Christi Davis League, for being a part of the signing. At Sundog Books with longtime friends, James Drake, Terry Edmondson and Walker Cagle. The kids have been troopers! 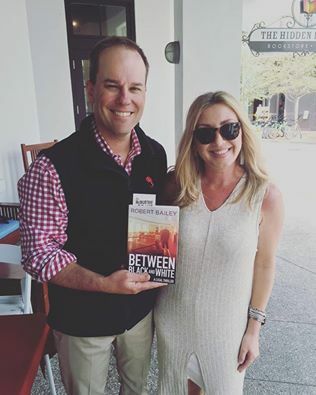 On Thursday, March 24th, we headed to Rosemary Beach for a signing at The Hidden Lantern Bookstore. Though the weather was rainy and breezy, we still had a wonderful day, selling 19 books despite the weather and meeting a lot of new fans of the series. It was fun seeing our friends, Steve and Christy Clark McDonald from Arab, Alabama. The Hidden Lantern is truly a hidden jewel of a store and owner Diane Carvalho and her entire staff were incredibly accommodating. Diane even found my five year old daughter’s missing doll! Such a fun time! So far, ten days in, “Between Black and White” is doing great and has risen to #2 on Amazon’s bestseller list for legal thrillers. And in this case, being #2 is ok, because I kind of like the #1 book…Ha! Stay tuned for more updates. Way to go Bob! I bought the book at Bienville Books in Mobile this week. I know it will be great! Thanks, Diane! Can’t wait to hear what you think! I have just discovered you after reading “The Professor” and “Between Black and White.” Both books were fantastic and could not put them down. We are from Birmingham, Alabama and my husband graduated from the University of Alabama in 1968 with a degree in Electrical Engineering. We live in Texas but our life revolves around Alabama. Our entire game room is filled with pictures of Bear Bryant and the championship teams. We even named our first son Bryant. My husband’s license plate in Texas is “BAMA.” Your books are better than John Grisham books and James Patterson books. You are comparable to Lee Child and Vince Flynn. “Between Black and White” is one of the best books I have ever read. Please write more McMurtrie and Drake thrillers. You are amazing and your books are mesmerizing. Thanks for two unbelievable books. Thank you, Elizabeth! I appreciate the kind words and am so glad you have enjoyed the stories. I am working on book three now and hope to have it out next year. Thanks, again! It sounds like your new book: “Between Black and White” is doing quite well Good for you because it was a Great Book! After I had read “The Professor”, I ordered “Between Black and White” from Amazon months before its release. I finished it in 2 days! Favorite “Legal Eagle”! So, have your fun and accolades now, but GET BACK TO WRITING! I can not wait for your next book. Thank you for a excellent read – 5 Stars! Thanks, John! So glad you are enjoying the series! I am actually working on book three now. Thanks again for the note and the words of encouragement! I could not put my iPad down. My husband attended Martin Methodist while studying Course of Study for pastoring at UMC. I was told about the Klu Klux Clan in Pulaski. I saw a B&B there but can’t remember the name, Court House, and several other places mentioned in the book. The storyline intrigued me and scared me when they gathered at the cemetery. Very good book and so was The Professor! Thanks, Linda! So glad you enjoyed the story. Glad you liked the Pulaski landmarks. I did a good bit of research on Pulaski so that the story would seem more authentic. Thanks again for your note!! 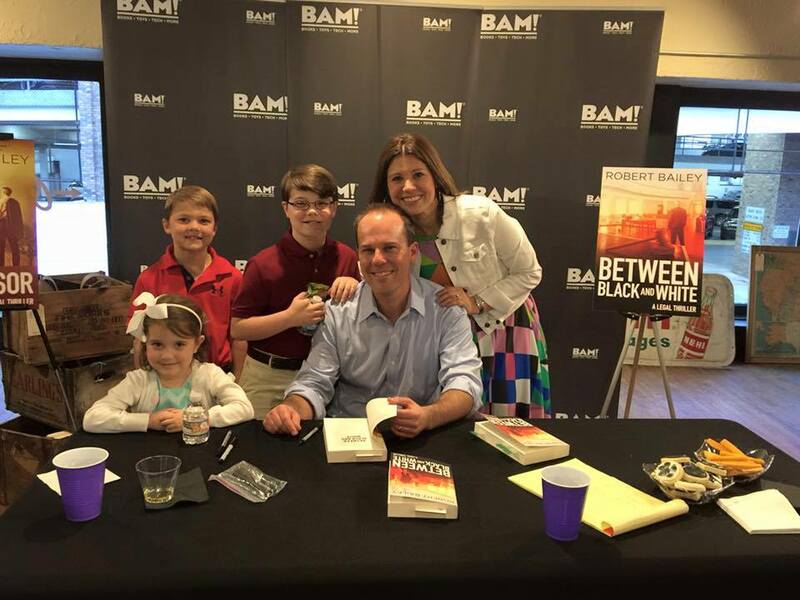 Members of the Magnolia Trace Book Club in Huntsville have bought and read The Professor and Between Black and White. Both books are excellent “who done it” with exciting twists and turns. Facinating stories! There is an error on page 375 of BB&W. The speaker in the fourth line should be Helen not Maggie. Thanks, Barbara! 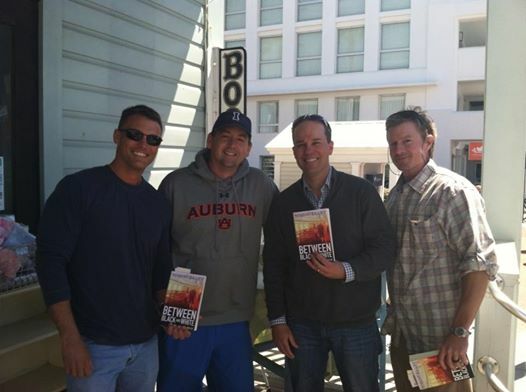 So honored that your book club chose to read The Professor and Between Black and White. And thanks for the head’s up on the typo. We will get that fixed for future printings. Thanks again for the note! I have been a claims adjuster for 47 years in various capacities including claims manager and product liability investigator. I am also an avid reader. I just finished The Professor and really enjoyed your book. So much that I just purchased Beyond Black And White. Although I live in Knoxville and am Vol fan I enjoyed the Alabama football history woven into your story. Keep on writing and ” Go Vols “. Thanks, Timothy! So glad you enjoyed the story and the football references. Hope you enjoy Between Black and White. Thanks again for the note! I stumbled on your first in the series a couple of days ago and stayed up late reading it yesterday. I’ve started on the second book and am enjoying it. Glad to hear you’re working on the third. Living in Huntsville, AL for about 5 years gave me an appreciation for Alabama, the loyal Bama fans, and Southerners in general. It was nice to read about some of the places I’ve been too. Your descriptions of the characters are also very vivid. Best of luck. Thanks, Jill! So glad you are enjoying the series, and I appreciate the kind words. Thanks, again! I live on Jefferson Street in Pulaski across the street from Miss Butler’s Bed and Breakfast! I read your book, BETWEEN BLACK AND WHITE and could hardly put it down to eat! It is an amazing book of fiction and I hope other readers recognize your outstanding talent of writing about “small town” happenings! Your books are masterful! I am so anxious to meet you at the Pulaski book signing May 10! We Pulaski residents are excited about your visit with us! I think you will be surprised at the questions folks have about local characters who “seem” to be in your book. I personally recognized some! Anxiously awaiting book #3. Please hurry! We readers are on the edge of our seats! Thanks, Danny Ray! So glad you enjoyed the story, and I can’t wait for our event tonight in Pulaski! I absolutely love Between Black and White. I have lived on the Alabama-Tennessee state line (hwy 43) my entire life, so I am familiar with all the towns and communities mentioned in the book. It made the book so exciting, couldn’t put it down. I stumbled across The Professor on my kindle. Being an avid Bama fan, the prologue had me hooked!!!!! Yes, he is THE MAN!! Great job on both books, and I can’t wait for the next one! I definitely will get the word out to my friends and family. Thanks, Melanie! So glad you enjoyed the stories! I’m working on book three now, which will be a continuation of the series. Hope to have it out next year! Thank you so much for THE PROFESSOR!… I ignored my family, tv, & other activities because I couldn’t stop reading it. I love Tom. I loved learning about BAMA. I’m old enough to remember Bear Bryant very clearly even though I live in Michigan. Thanks for the history of him, the university, & Alabama. Your characters cam alive on the page for me. Showing the good ones vs. the evil ones & those caught between was gripping. I’ll be buying your next novel & the next & the next! Again, thank you for the pleasure. Thanks, Carole! I’m so glad you enjoyed the story. 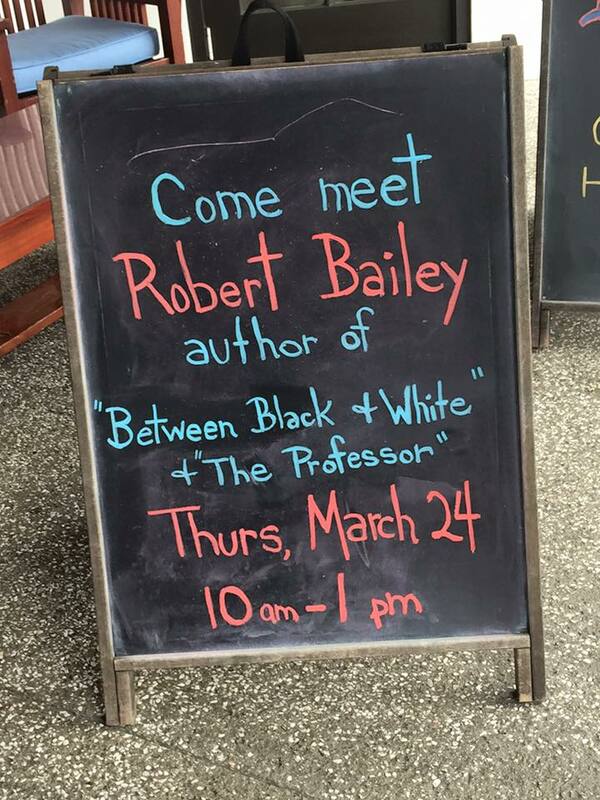 I hope you will take a look at BETWEEN BLACK AND WHITE, which came out in March and is the sequel to THE PROFESSOR. I’m currently working on a third book in the series that I hope will be out next year. Thanks again for your nice note! I’m in the middle of Between Black and White now. The trial is about to begin. I’m really enjoying it. Pacing is perfect. I am very glad I read The Professor first since so many characters (good and bad) return . Thanks, Joe! So glad you are enjoying Between Black and White. I appreciate the note. I have been selecting my husband’s books for the past forty years. He is a voracious reader and reads three to four books a week. I stumbled upon your books on Amazon and my husband finished both in three days and said they were on par with Grishams early works. He loved them. I am now deep into The Professor and also concur with Tim that your book is fantastic. I am donating both copies to our library after our daughter reads them. 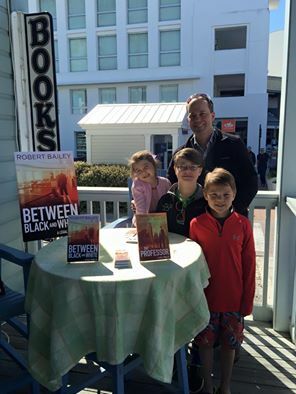 We spend the winter in Vero Beach, Florida and there is an independent bookstore that has authors visit. Are you willing to do author visits? Can’t wait for book number three. Keep up the great work. Hey, Krisi. Thanks so much for your note. I’m so glad that you and your husband have enjoyed the stories. I have done quite a few author visits and am always open to doing more. Perhaps I could do one at the Vero Beach bookstore down the line–that would be great! I am busy at work on book three and hope to have it finished this summer/early fall and published sometime next year. Thanks again for your note!! Thanks, Ken! So glad you enjoyed the story. I’m working on book three and hope to have it out next year. Thanks again for the note! Mr Bailey, I just finished “The Professor” ,what a great book ,a real page turner hard to put down. Very good sir. Thanks, Gary! So glad you enjoyed the story and I appreciate the note. I’m working on book three and hope to have it out later this year or in early 2018.